Fermentation is one of the oldest, easiest, and healthiest ways to preserve and ferment food. Natural, lactic acid fermentation allows vegetables to retain more vitamins and minerals than most other methods. Designed for making bountiful batches of sauerkraut, pickles, or preserving other foods. The lead-free, food-safe glaze will not retain the food's flavors and makes clean up easy. 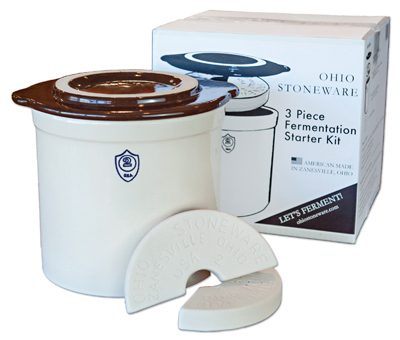 The two semi-circular stone weights rest on top of the food inside the crock and create the pressure needed for proper fermentation. 3 gallon crock is perfect for batches of pickles and sauerkrauts. Classic pickling and fermentation crock perfect for many uses around your home. 5 gallon crock is perfect for batches of pickles and sauerkrauts. 10 gallon crock is perfect for batches of pickles and sauerkrauts. 1 gallon crock is perfect for batches of pickles and sauerkrauts.